White (she later added her mother’s maiden name to make Bourke-White) turned her photographic hobby into a profession as an industrial photographer and then as a photojournalist working for Fortune and then for Life. 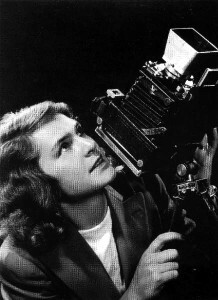 She photographed extensively in Depression-era America and in Germany and the Soviet Union before World War II, then covered the bloody Italian campaign during the war. She accompanied General George Patton’s Third Army into Germany and documented the horrors of the concentration camps. After World War II, she photographed Gandhi in India and served as a correspondent in the Korean War.